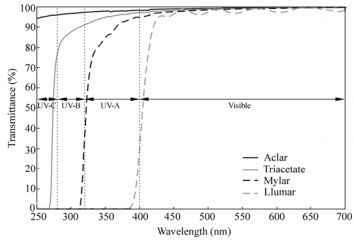 Global UV climatologies (Lee-Taylor and Madronich, 2007), which were calculated with the TUV1 radiative transfer model (Madronich and Flocke, 1995), were used to directly compare vitamin D weighted UV and erythemally weighted UV. In both cases, the weighting functions are as adopted by the CIE, extending to 400 nm in the case of UVEry, (McKinlay and Diffey, 1987), and to 330 nm in the case of UVVitD (Bouillon et al., 2006). If the truncated version of the vitamin D action spectrum had been used, the peak value would be reduced by approximately 5%, with larger percentage reductions for smaller doses (see discussion of Fig. 2.5). The climatologies are based on over 20 years (1979 - 2000) of satellite-derived data from the NASA TOMS instruments. Since temporal changes in ozone have been relatively small over most of the globe, these climatologies still apply for present-day ozone fields, and for those expected in the future. In the Antarctic region, ozone amounts have been lower in spring, but the summer and winter conditions illustrated have been less affected by the springtime ozone hole. Furthermore, as ozone is expected to recover in the future, the mean UV intensities, over the period the satellite data is used, are likely to be similar to the means over the next few years. 1 Tropospheric UV radiative transfer model developed at NCAR, USA. more comparable with those in the northern hemisphere. The UVVitD doses show a stronger latitudinal gradient than the UVEry doses. 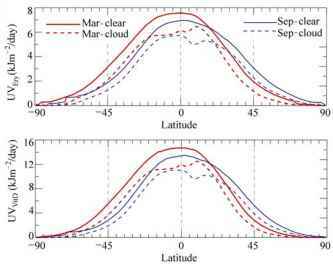 When cloud effects are included, these tend to reduce the doses of both UvvitD and UvEry in the southern hemisphere more than in the northern hemisphere, especially at latitudes pole-ward of about 60°S. The upper panel of Fig. 2.9 shows the cloud effect expressed as a ratio of the clear sky values to cloudy sky values. For cloudless skies, this ratio is unity, and decreases as clouds increase. 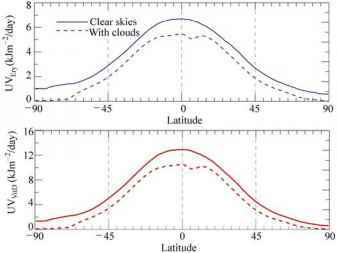 These cloud transmissions tend to reduce towards higher latitudes. 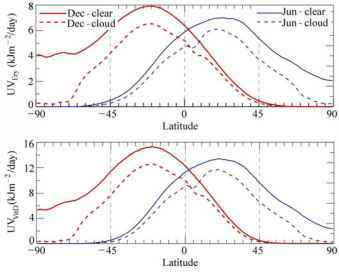 In the southern hemisphere summer, there is a rapid reduction in cloud transmission between latitudes 60°S and 70°S, indicating that cloud cover in this region is quite persistent in the summer, as has been previously noted (Herman et al., 2001). The lower panel of Fig. 2.9 shows the ratio UVVitD/UVEry for these daily doses. Near the latitudes with peak UV, the daily doses of vitamin D-weighted UV are approximately twice those of erythemally weighted UV. This shows that the daily doses are dominated by the contributions from near noon when the SZA is smallest. 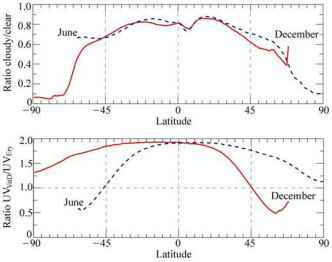 The decrease is more rapid in the case of vitamin D-weighted UV, and the ratios reduce to below unity at latitudes where the UV is low (e.g., approaching the poles). ozone hole are just detectable poleward of about 60°S. Note that contrary to public concern in New Zealand and Australia about high levels of UV radiation during this period, the doses, even as far south as 45°S, are in fact smaller than at 45 °N. This is because, despite the presence of the ozone hole over Antarctica, the ozone amounts at mid-latitudes in both hemispheres are much larger in spring than in autumn. However, at the higher latitudes of the southern tip of South America (50°S - 55°S), the ozone hole does lead to significant UV increases in populated regions during spring and early summer (Bernhard et al., 2008). The annual doses are compared in Fig. 2.11. In this case, the maxima occur in the tropics and tend to be slightly larger in the southern hemisphere, with the exception of the Antarctic region, where they are lower than at corresponding Arctic latitudes. This shows that in an annually averaged sense, the effect of increased cloud cover in that region dominates over any effects due to the ozone hole. In the following section, we use the spectral measurements at Lauder to develop relationships between UVVitD and UVEry. These are tested against calculations with a radiative transfer model and then applied to calculating the optimal times for exposure to sunlight to maintain adequate levels of vitamin D without incurring sunburn.